ATSAMW25 M0+WiFi and 96Boards IoT Modules now in Geppetto | Gumstix, Inc. | Gumstix, Inc.
We are kicking off 2018 with two IoT modules in Geppetto: the ATSAMW25 M0+WiFi and 96Boards IoT Connector. This new module is found under the ‘Processors’ shelf in the Geppetto library. The Microchip SmartConnect SAMW25 is a Wi-Fi certified, low-power module. Moreover, it makes development for Internet of Things (IoT) accessible. Now that this module is in Geppetto, you can customize a microcontroller for your needs. Last year, we released RoomSense to showcase the ATSAM25. As the name implies, RoomSense can detect occupancy with its on-board passive-IR motion sensor, and environmental conditions, such as temperature and humidity. This module is found under ‘COM Connectors’ shelf in the Geppetto library. The 96Boards IoT Mezzanine Connector consists of a 40-pin GPIO header compliant with the 96Boards IE specification. 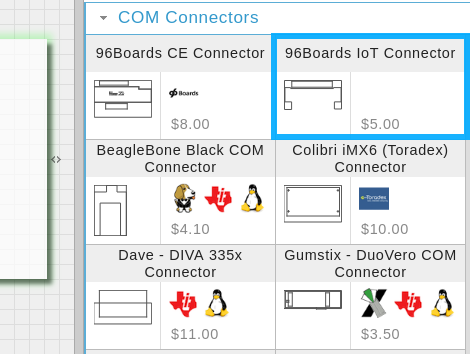 The 96Boards IoT Edition (IE) platform is designed to support development in the Internet of Things (IoT) space. When you use this module in your design, you will be able to connect 96Boards IE microcontroller boards like Carbon, Nitrogen, or Orange Pi i96. With this two new modules, customizing and creating your own microcontroller with the ATSAMW25 or expansion board for any of the COMs compliant with the 96Boards IoT Edition is easy with Geppetto. Just drag-and-drop the modules you need and let the app guide you in completing your design.